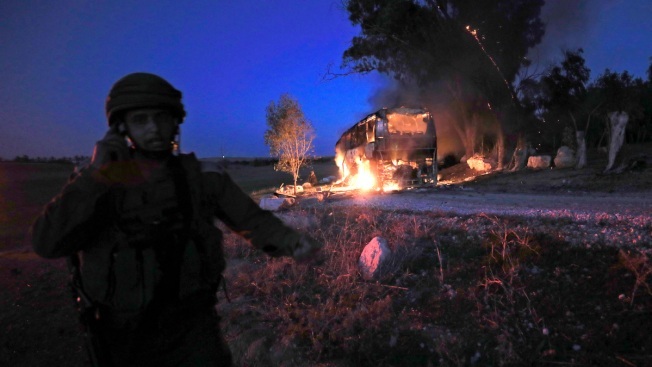 An Israeli soldier stands near a burning bus after it was hit by a mortar shell fired from Gaza near the Israel Gaza border, Monday, Nov. 12, 2018. Israeli media say six people were wounded by Palestinian fire, including a 19-year-old who was critically hurt when a mortar shell hit the bus. Palestinian officials said at least three people, including two militants, were killed by Israeli fire and nine were wounded, and an Israeli airstrike destroyed the ruling Hamas group's TV station. In Israel, the national rescue service said at least 20 people were wounded, including a 19-year-old soldier and a 60-year-old woman who were in critical condition. The fighting cast doubt over recent understandings brokered by Egypt and U.N. officials to reduce tensions. Just a day earlier, Israel's prime minister had defended those understandings, saying he was doing everything possible to avoid another war. The United Nations said it was working with Egypt to broker a halt in the violence. "Rockets must STOP, restraint must be shown by all!" the U.N. Mideast envoy's office tweeted. Around sundown on Monday, militants launched some 100 rockets in less than an hour, the most intense barrage since the 50-day war four years ago. The outgoing rockets, which continued into the evening, lit up the skies of Gaza and set off air raid sirens throughout southern Israel. "We continue to strike and retaliate against the military targets belonging to terrorist organizations in Gaza, and as for our intentions we will enhance these efforts as needed," he told reporters. Late Monday, an airstrike destroyed the Gaza City headquarters of Hamas' Al Aqsa TV station. Israel had fired warning shots ahead of the airstrike, prompting the station to halt programming and replace it with a logo. Minutes later, the airstrike flattened the three-story building and the station went black. Hamas spokesman Fawzi Barhoum condemned the bombing as "a barbaric, brazen aggression." Ten minutes later, the station resumed broadcasts, airing prerecorded national songs. Israel said the station "broadcasts violent propaganda" and provides "operational messaging" to militants. A five-story office building that housed Hamas media offices and another building used by Hamas' internal security service were also destroyed. No casualties were reported. Hamas and the smaller militant group Islamic Jihad said the rocket fire was revenge for Sunday night's Israeli incursion. Islamic Jihad spokesman Daoud Shehab said the groups wanted "the occupation and its supporters know that the lives of our sons come with a price." Michael Oren, an Israeli Cabinet minister, said Israel "will do whatever it takes" to defend itself. "We expect the world to stand with us," he said. The EU's ambassador to Israel, Emanuele Giaufret, called for a halt in "indiscriminate" rocket fire toward civilians. "Everyone must step back from the brink," he said. Earlier Monday, thousands of Palestinian mourners buried the seven militants killed in Sunday's incursion. Hamas leader Ismail Haniyeh led a funeral as masked gunmen in uniforms carried coffins and mourners chanted "revenge." Hamas also canceled a weekly beach protest in northwestern Gaza along the border with Israel. The organizers cited "the ongoing security situation." Israel and Egypt have maintained a blockade on Gaza since the Hamas takeover. The blockade has devastated Gaza's economy. The Hamas military wing said that in Sunday's incursion, Israeli undercover forces drove about 3 kilometers (2 miles) into southeastern Gaza and shot and killed a mid-level commander in the southern Gaza town of Khan Younis. Hamas militants discovered the car and chased it, prompting Israeli airstrikes that killed several people, the group said. In a tweet after his arrival back home, Netanyahu praised the slain officer, whose identity was kept confidential for security reasons, and said: "our forces acted courageously." The officer's funeral was held Monday. AP writer Isabel DeBre contributed to this report.